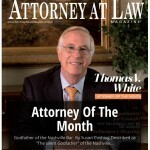 Thomas V. White’s thoughtful and steadfast approach to the law has earned him recognition and respect among his peers in the legal community and has led to his selection as Attorney at Law Magazine’s “Attorney of The Month” in Middle Tennessee. The article highlights Thomas V. White’s enthusiasm and talent while also recounting his background, the formation of Tune, Entrekin & White, P.C. and his home life. Read the full article “The Godfather of The Nashville Bar” by Susan Cushing. For more information about Attorney At Law Magazine, Middle Tennessee Edition, visit their website.